FALSE negative test results can be a trap for GPs who suspect Buruli ulcer in their patients, particularly those who present before any ulceration has occurred, or are children, say experts. In a research letter published by the MJA, the authors found that of 551 patients with prospectively confirmed Mycobacterium ulcerans disease diagnosed between 25 March 1998 and 13 February 2018, the polymerase chain reaction (PCR) assay result for the initial swab specimen was negative in 34 cases (6.2%), but PCR results for repeat samples were positive. “The initial negative test led to a diagnostic delay of as long as 74 days (median, 17 days; [interquartile range], 9–33 days),” the authors wrote. Lead author of the study, Associate Professor Daniel O’Brien, an infectious diseases consultant with Barwon Health in Geelong and the Royal Melbourne Hospital, told InSight+ that successful treatment of Buruli ulcer remained early diagnosis. “The sooner you get the diagnosis, in general the smaller the lesion is, and therefore the treatment is much simpler, quicker and the healing much more rapid,” he said in an exclusive podcast. Buruli ulcer is caused by M. ulcerans and is a necrotising infection of the skin and soft tissue. It is endemic to the coastal regions of Victoria and northern Queensland (where it is known as Daintree ulcer). Numbers of Buruli cases have exploded in Victoria in recent years. “Every year for the past 3–4 years, we have been having about a 50% increase in the number of cases,” Associate Professor O’Brien told InSight+. “What we’re seeing is a rapid increase in the number of cases, we’re seeing it moving into new areas and we’re also seeing a high proportion of the cases being severe, so those three things are cause for concern. With early diagnosis the key, Associate Professor said the big message for GPs and other practitioners who suspected Buruli ulcer in their patients was swabbing technique. “The PCR test is in fact a very good test. It’s highly specific and highly accurate, if it’s performed properly and appropriately,” he said. “I realised that there are clearly some pitfalls in the performance of the test that can lead to adverse outcomes. “One of the key points about the Buruli ulcer is that it’s not always an ulcer – in fact in 15% of cases it won’t be an ulcer, it’ll either be a nodule or it’ll be a cellulitis, a red swelling of the limb or joint. “When it’s actually ulcerated, the test is reasonably straightforward. As long you swab around the undermined edges of the wound and then make sure there’s clinical material on the swab, that should almost always be positive. 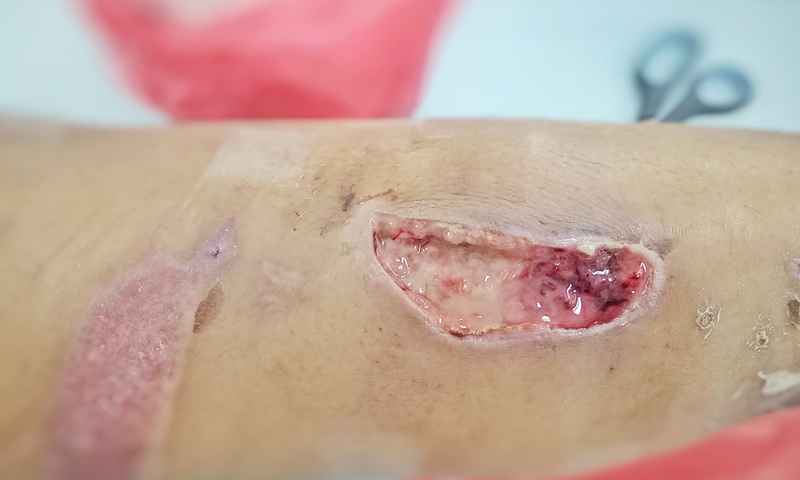 “But if the lesion hasn’t ulcerated and you just swab the surface of the lesion, which some people do, then that will be negative because there are no actual organisms on the surface of the wound. They’re underneath the skin in the subcutaneous tissue, and that’s probably one of the major pitfalls that people fall into. So, why is Buruli ulcer on the increase? “That’s the great unanswered question,” said Associate Professor O’Brien. “The major difficultly we’re facing is that we have a knowledge gap around exactly where the organism lives in the environment and how it’s transmitted to humans. “We don’t really understand why in Victoria, especially, we’ve got a rapidly increasing and spreading outbreak when you consider in the rest of the world, in fact, it’s a tropical disease found in tropical areas and the number of cases worldwide are in fact falling. “We recently received [a National Health and Medical Research Council] grant in a consortium with Melbourne University, Barwon Health, Mornington Peninsula Council and the state government to look exactly at this,” he said. “[First], we’re having a look at the environment and the humans and the animals and trying to work out what the risk factors are for acquiring the disease. “Secondly, we’re doing an intervention study where we’re going to target mosquito control. At the moment that’s our best guess, that mosquitoes are involved somehow in the process. In the meantime, despite the relatively small endemic areas for Buruli ulcer, GPs across the country need to be aware, Associate Professor O’Brien said. “[The places] where it occurs in Victoria are very popular tourist destinations, so this is really relevant for health practitioners throughout Australia and internationally,” he said. “People come to visit from all parts of Australia and then they return home. The disease takes 4–6 months to become clinically apparent, and unless people are aware of this outbreak and how to diagnose it, then it won’t be picked up because the normal test won’t be positive. You have to ask for this specific M. ulcerans PCR test otherwise it gets missed. “The most important thing is to be aware that there are circumstances that can mean that the initial test is negative and to not discard the diagnosis on the basis of one initial test. There seems to be an obsession with laying the blame for an infectious disease on other countries and species. Hence we have the Spanish Flu, Hong Kong Flu, avian flu and swine flu. Never the Aussie Flu . This xenophobic tendency helps explain the shift from Bairnsdale ulcer to Buruli ulcer in recent years. Clinically , whilst sharing the same bug Buruli is a more severe disease. Bairnsdale ulcer at least represented the early description of the disease in Victoria and the local work by John Hayman. Perhaps it instilled fear in the tourists, who knows?